EDMOND, OK (Dec. 7, 2017) – Debreon Davis, principal at Edmond North High School, received a big surprise – a $25,000 surprise – at an all-school assembly this morning with a $25,000 Milken Educator Award from Lowell Milken, chairman and co-founder of the Milken Family Foundation. 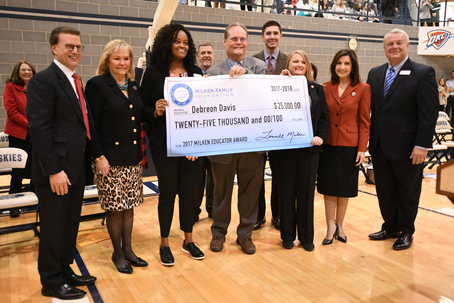 Davis, one of 44 honorees across the U.S. for 2017-18, is the only Milken Educator Award winner from Oklahoma this year. Davis is known in the district for setting high expectations for her students and faculty. 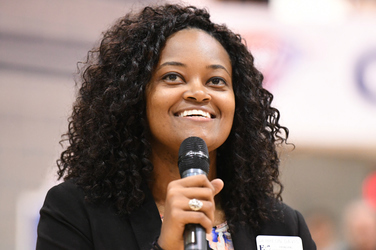 Last year, she served as an assistant principal at Edmond Memorial High School, where students of all learning abilities have improved their academic performance. Davis advocates for community outreach, faculty collaboration and technology integration, all of which help students prepare for postsecondary educational opportunities. State Superintendent of Public Instruction Joy Hofmeister said Davis represents the best of Oklahoma educators. Davis is a leader on campus and off. Working with pre-teens and early teens, she mentors young adults through the local Young Life group and during summer camps in other states. Davis also volunteers as a board member of the Oklahoma City Dream Center, a nonprofit offering those isolated by poverty access to services that meet basic needs to help them get back on their feet and provides preventive programs for at-risk youth. Local dignitaries joined the celebration, including Gov. Mary Fallin, state Sen. Adam Pugh, state Rep. Ryan Martinez, state Rep. Mike Osburn and representatives from the offices of U.S. Sen. James Lankford, U.S. Sen. Jim Inhofe and U.S. Rep. Steve Russell. The Milken Educator Awards, hailed by Teacher magazine as the “Oscars of Teaching” have been opening minds and shaping futures for 30 years.